YouTube channel is for personal and business use. 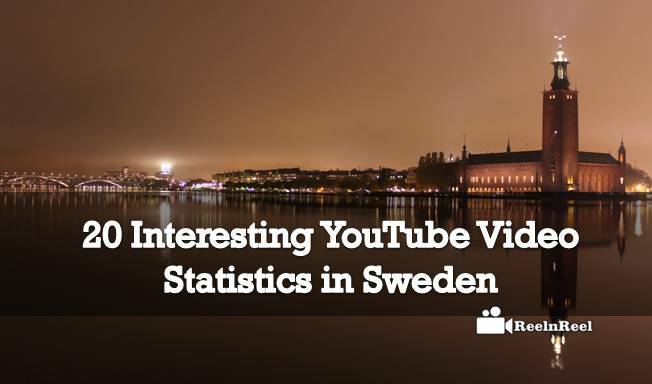 Everyone can use it for personal uploads here we have listed some interesting YouTube Video Statistics of Sweden. All countries use YouTube for different purposes, but Sweden people use less for YouTube because of some reasons. Statistics vary from other countries. 1. More than 35 percent internet users are utilizing the YouTube daily in Sweden. 2. The number of users watching Youtube videos daily in Sweden is three times increased compared to its previous statistics reports. 3. The local news services in Sweden are running video platforms which are placed in top five social platforms namely AftonbladetTv. 4. More than 9 percent ,Sweden people are using these local digital video platforms, especially during the news polling sessions. 5. Another platform of Swedish public broadcasting was utilized by more than 9 percent people in Sweden. 6. According to the survey reports on the frequency of utilization of the YouTube Video Statistics in august 2016 revealed that 45 percent males and only 25 percent females in Sweden are watching videos in the YouTube platform daily. 7. One out of three people in Sweden is watching YouTube video every day. 8. Seven out of 10 Millennials are visiting YouTube everyday in Sweden. 9. In a March 2016 Sweden survey, it is noticed that 70 percent internet users are using YouTube platform each day between the ages 15 years to 22 years old. 10. 48.2% People aged between 23 to 35 years are watching YouTube daily in Sweden. 11. More than 30 percent people aged between 26 to 55 years are using YouTube platform daily in Sweden. 12. The YouTube viewing penetration rate decreased with age in Sweden as it is noticed that only 11 percent people of these ages are watching YouTube videos daily. 13. 16 percent Sweden population is watching Youtube videos at least once a month at an average. 14. 20.4 percent female population in Sweden is watching YouTube videos at least once in a month. 15. 8 percent males and 13 percent female Sweden citizens are less frequently watching the YouTube videos. 17. 7 percent female citizens reported they didn’t watch YouTube videos. 18. Total 6.2 percent at an average Sweden people never watched YouTube videos. 19. More than 36 percent total Sweden population is watching Youtube videos every day. 20. Total 32 percent Sweden population are using YouTube at least once a week. All these above are the YouTube Video Statistics data of Sweden in Youtube video usage from various surveys and research reports published in 2016 and are expected to increase or decrease in 2017.